My name is Jana Markova, I am a 26 years old Czech girl, graduated from Sorbonne University in Paris, currently living in New York city. I speak Czech, French, Spanish and English and it has been for five years, that I was experiencing the precarious mental pattern called Anorexia Nervosa. For a long time, I was thinking about writing an article about my personal story to share my experience and through it, to raise awareness about the Eating Disorder issue that is still seen as a weird social taboo, as well as to motivate, and maybe to help the others, that could identify with what I’ve gone through. Looking forward is kind of difficult for me. Should I start by saying that for all my life, I’ve been an extremely self-critical and perfectionist person? That my parents somehow inserted in me an everlasting fear that I will disappoint someone? I think that even if my family background and those characteristics of mine played an important role in the development of my mental issues, there had to be a particular life situation that pulled the trigger. I don’t remember exactly how and when it begun, but it was sometimes around the summer 2011. At the time, I was in a strange relationship with a boy that loved to hang out with friends with a drink. Basically, he was living with me in my apartment that I shared with my friend from high school. Somehow, the relationship, for longtime happy, started to turn bad. I remember that I got the impression that my boyfriend prefers to go out and hang out with his friends rather than to be with me. I felt that he didn’t listen to me, he didn’t perceived me. He was also criticizing me a lot for how I was and tried to change me according to his image. Like if he was thinking only about his point of view and himself. I remember that I start to feel very sad, abandoned and lonely. At this time, I was not able to smile and to feel happy. I think that’s when my depression started. Also, as I was not happy, I started to shift my attention to my body. As I was drinking a lot of alcohol and not moving at all, I gained some weight and wanted to lose it. So, during the summer I was trying to eat healthier (as until this moment I ate in quite unregular way – no breakfast, some quick lunch, weird dinner), to ride a bike and to drink less. I was a normal girl, loving to hang out with friends…. At the same time, there were other things happening – it didn’t go well with my roommate either. Actually, she came from a problematic family with an alcoholic father and I offered her to stay with me to help her. But progressively I found out that there are many things she was not raised to do and to live with her became very difficult. She didn’t care about the housekeeping, she didn’t clean up the dishes, she didn’t help me with anything and she didn’t even ask me if I need some help. At some point, I started to feel very uncomfortable in my own apartment. And, I was not assertive enough to talk with her about those issues in a straight and quiet way, so I was just keeping the rising tension deep in me. In addition, I had a problem with my mother to whom I was not talking from my adolescence. I remember that at the point my relationship went really wrong, I started to feel completely abandoned. I didn’t know to whom to talk and I even was not able to do it, as I was (and I am still) very introverted. So I just left all my bad thoughts rising inside me to the point I felt that my whole life is falling down. Like a house of cards. I felt desperate, I wasn’t able to laugh, to enjoy the life. I was indifferent to everything. One evening, during this desperate time of mine, someone told me, just to tease me, that I am “putting on weight”. I remember until now the thoughts I got this evening in my head. I wanted to suffer and I decided to do it by not eating. I think I wanted to show the world how I feel without telling them. That was sometime at the beginning of September 2011. I progressively reduced my nutritional intake to minimum. I was counting the calories of every single item, every small fruit I ate, every slice of bread, even the vegetable. I was eating only low fat or fat-free yogurts. I remember some particular moment from this period– I remember is a bike trip I did with my father one sunny Saturday. It was one of those beautiful autumnal days, that are full of sun and calmness. And it could have seemed that we were having a great time, but I didn’t feel OK. I remember how I was stressed when we came back to Prague and sat in a restaurant for a late lunch. Even if we were cycling almost all the day, I was very worried about a normal lunch in a normal restaurant. A lunch the composition of which I couldn’t control. I remember also that I was extremely scared of carbs. I eliminated almost all of them from my diet. I ate only some tiny oatmeal flat cakes I made myself. I didn’t eat a proper lunch that I replaced by carrots and cucumbers. I was scared even of the milk in the coffee and those delicious small biscuits you get in the cafes on the side of your cup. One of my favorite items was a low-fat unsweetened buttermilk. I was also very scared of fat – while I had to eat at my parent’s house, I was very anxious about what my mother is cooking and how. I remember that I was really hungry but I didn’t allow myself to eat, trying to switch attention to something different. I was working hard for school, I was riding a bike. My perception of the world became distorted. Like if I was permanently drunk, or in a bad dream. I didn’t really perceive others, all my attention was concentrated around the food. I was hungry but I was not allowing to feed my body. It was a permanent struggle. During end of October, I went with my university mates to the film festival of documentary films in a small Czech city. We slept in the school gym with mats and sleeping bags. I remember a terrible cold and problems with sleeping. I also remember that my parents, that were already worried about me, went to pick me up at the end of the festival. First thing I was asking them on the phone was if we would stop somewhere for a dinner. I needed to know if I am allowed to eat something during the day or if I need to stay hungry as the dinner would fulfill my daily nutritional income. That day, I ate only some few pretzel sticks. I was so hungry but I was keeping torturing my body. I really wanted to make it suffer as my soul was suffering. On antidepressants during winter holidays with my sister I was also exercising a lot to compensate the small amount of food I ate. I was riding a bike, doing roller-skating, going for Pilates lessons. Once the winter came, I switched to ice skating and I started to do Zumba. I really don’t know how I could bear all those physically challenging activities with such a small nutritional income. I was completely out of reality, I think I ceased to feel my body as well as my suffering soul completely. I separated myself from my friends, I was staying more and more alone, home. I was very selfish at the time. From the beginning of September to Mid-October, I lost about 10 kilos, from some 62 it was first 57, then 56…. Progressively, I went to the 52 that started to be very alarming. I started to be aware of the problem and I was scared as I could not stop the behemoth I started. What will happen if I lose even more weight? I was paralyzed and caught in a kind of vicious circle that had gone out of my control. During this time, I separated with my boyfriend (which was a good thing to do) and my family started to see that there is something wrong with me. I remember that I told about my problem my closest friend. By some coincidence, at this time she needed to stay in my place for several weeks because of some reconstruction in her apartment. So, we tried to cook together and eat together. She was very tolerant to my paranoiac problems with items as the heavy cream was and she was willing to substitute those items by some (for me) “healthier” and less caloric variant, if I would eat the food. She made lots of compromises with me. She also went with me to Brussels to visit my aunt during the October holidays. 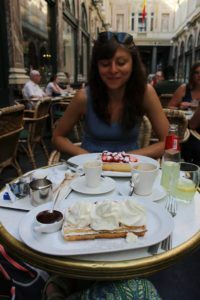 Oh, how I remember this trip – visiting Bruges, the city of chocolate, without daring to taste even the smallest bite as well as being consistently scared of eating out in the restaurants. I remember that one evening we went to some fish restaurant and when we went home, I was controlling on my computer how much calories I ate….Hopefully my friend was there to stop me. Sometimes she went also a bit angry with me when she didn’t know how to cope with my thoughts. “You will eat the soup and not the salad you need to eat!” – she told me during a lunch at one nice café. It sounded really like a severe order. And, I knew that I have a problem and I was listening to her because I trusted her insight more than the mine. Like this, my weight went stabilized at 52 kilos, but mentally, I was still completely elsewhere. Sad, tired, out of myself, depressive, scared, anxious… Finally, it was my mother that persuaded me somehow to go to see the generalist doctor. I don’t remember when and how, but I started to talk to her. I think I needed help as I could not cope with myself at all. And suddenly I understood she was there to listen and to help. How lucky I was to have my family and my friend around at this time. So, at the beginning of December, I went to the generalist doctor that my mother knew as she worked with her at the same place (my mom is a pediatric doctor). The doctor was very nice to me, she asked me why I am here and gave me some tests to fill. She explained me that I seemed to have a depression and the test confirmed it. She decided to prescribe me some antidepressant medication. It was called Cipralex. She also recommended me a psychologist/psychiatric doctor that I contacted afterwards. This first visit calmed me down a bit as I had impression something is happening and moving towards the solving of my issues. But I was still not able to cope with them myself. At this time, I went also to the psychologist. I don’t remember very much the first visit, but I know she gave me some tests and drawings to do. She asked me what is my weight. And that was almost all. She told me that I had surely a distorted image of myself and I am extremely perfectionnist. I went to her after two weeks or so again, she asked me again about my weight. My weight was still the same. She told me that I was mentally ill and she couldn’t help me, that I had to gain weight. She was very strict. I remember I went from her orientation crying. I was hoping to get some advice, help and direction to follow, but instead, someone designed me as ill and unable to cope with myself. Even if I knew it, I think I didn’t want to hear it and to admit it really. I talked to my mother afterwards and I never went back to this doctor. I think this period from September to, let’s say, February was one of the most difficult moments, when I completely lost myself and I was very dependent on my closest ones. Luckily, they were there. My problem was no longer a secret to them and I could talk to them and to cry on their shoulder. They could at least a bit control my eating. My mother was coming very often to my apartment with food she cooked at home, already separated in portions. And I remember I ate this food. She didn’t really obligate me, but I trusted her. And she also didn’t force me to eat what I didn’t want to. I had also a new boyfriend, so when he was with me we ate together. I still ate really small portions and was very afraid of gaining weight (that I really needed), but at least I didn’t lose more. I had also still very big problems with sleeping so my doctor prescribed me some sleeping pills. But in general, the situation was somehow more stabilized. I remember that one weekend of January or February we went with my boyfriend to a small walk and I told him that I felt for the first time after a very long period calm and quiet… I don’t really remember the following months. I know I went to lots of doctors with my mother, to verify that my body is OK. I did echography of my stomach, I did a lots of blood exams, etc.…Luckily, I was healthy. During January and February there was the period of exams, so I was learning a lot, and I don’t remember it so much. I remember some moments when my friend was studying with me at my place and some nice moments with my father. We went ice skating sometimes. Actually, my father didn’t talk much with me about my problems, but he was there to listen. With him, I always felt like if the situation was not so serious. Like an escape to the world where everything is OK.
During spring, the things got better. The new semester started and I met some new people. I also went to a nutritional therapist that my doctor recommended me. This lady created for me a diet-plan I could follow. She was dealing with me like with a real client, not like with a fool, mentally ill person, so I felt good with her, I trusted her and I was willing to cooperate. And I was following the meal plan she created very conscientiously. She didn’t indicate me the portions and calories, she just added items. This fact was good as I stopped to control calories. However, I was also free concerning the portions, I was not gaining too much weight, but at least I started to eat more and regularly. I started to look better, less tired and more self-confident. Like if started to re-find myself, like if my spirit went back to my body. I was still very careful how much I am eating and worried about gaining too much, but the slow process of recovery started. I never skipped an item and was very serious about my recovery. On the other hand, I was keening very meticulously on the scheduled times and items of my diet-plan. It was impossible for me to eat the dinner sooner than planned, to eat a snack sooner than indicated or even to eat some extra food. My family, mainly my mother, was respecting those facts with comprehension and they were trying to orient common dinners, restaurants and lunches according to my needs. I really appreciate their patience. Also, the new semester started and I met new people and started to reconnect with my old friends. During April, I went with them to the film festival of Animated film to a small town called Teplice. It can sound silly, but I was very scared of the trip. I was supposed to sleep, again, in the school gym. And I was worried and not sure if I can handle a different day schedule and a different place and even the journey. At the period, every change was for me very terrifying. Despite all those fears, I went there, and to my surprise, I handled it quite well. I also celebrated during this festival my birthday and for the first time after my depression started (almost a year), I experienced a happy feeling. After this reinforcing experience that helped me raise more self-confidence and showed me that I am able to “function” and to interact again with people, things went really better. I understood that my relationship is not ideal and I broke up quietly with my boyfriend. I was also able to put together a student film festival that I directed with one of my good University friends. It was very intense in the terms of energy and organization, but I overcame all this without even losing weight. My doctor also told me that I looked better. At this time, I made also an important decision – I wanted to do a student exchange program called Erasmus in Paris. Actually, I wanted to go there already a year before, but I didn’t do it because of my relationship. Now, I felt free and since to live in Paris was my dream, I decided to apply. I think my parents had to be very worried about my idea of going abroad, as the won’t have any control of what is happening with me, but they might have also think that meeting new people as well as to change the environment could help me. So, they supported my decision. (Years later, I was talking about it with my mother and she told me that they were really scared. They thought that either it would help me or either it would completely break me down. But they could not stop me, so they let me go.). The application process was quite a formality, as there were more places than applications, so I got accepted easily. I had a very nice summer – I went to a music/theater/film festival called Boskovice, with my sister, closest friend and some other mates. We also put together an amateur movie with my friends from University – a very funny fairy tale. 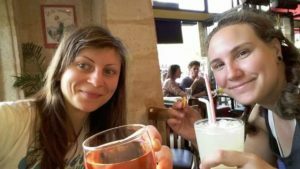 And, we did a 3-week long holiday journey with my sister: We travelled around Crete and Italy, by train, busses and planes. We were moving from place to place with big bags. Even if was still very prudent when it came to food (I think I was still worried about carbs – I ate some, but not enough to gain weight and heal, and I was reducing them even more in the situations where I felt I am not the overall control among the food), I was able to taste many local items and sometimes event got an ice cream or pasta. Again, it may sound very silly, but I was really very happy that I allowed myself to eat such foods, even if in small quantities. Also, my mental state was quite fine during the journey. I was more stable and more quiet and happy to discover new places. However, even if I ate and felt better, my eating was not enough to the energetic expenses of the travelling and I lost weight during this time too (about 1 Kg?) and approached 51 kg. Well, I didn’t have the problems to re-start to follow my diet plan once back in Prague, so the end of the holidays was quite calm. But as the new school year started it was time to move to Paris. How I liked those terribly thin legs…. I went there during the September with my cousin and one friend that both helped me with the moving out and in. As my application for the university housing was denied, I moved alone in a quite small (but still enough big to what would come afterwards), but expensive apartment (the prices of aparts in Paris are very high, but it is another story…) several weeks before my university started. I was excited and I decided that I will start a new life there, without counting calories and without even having a scale that would impel me to control the weight. I remember there was also my mother and sister that came to visit me as well as my closest friend. She was actually the last visit I had before the university year started and I remember that when she entered the metro to the airport I started crying. I realized that I was alone in a foreign county, in a big city I didn’t know and where the people were speaking another language (even if I knew French, it was difficult at the beginning). At this moment, I felt scared of what would come. And, the beginnings were for me very hard. I was thrown to the French administrative system that I didn’t understand, at the university no one really helped us with the course registrations. Even if I had some Erasmus friends, I felt often alone during the evenings in my apartment, like if I was separated from the rest of the world. Also the weekends were very difficult to me as often I didn’t have anyone to join me for some visits and activities. So I was discovering the city on my own. I liked it, but it was very easy to fall back to my bad thoughts hidden in my mind and still not healed. Moreover, I was lost in the supermarkets and didn’t know the products. And everything was very expensive and I was worried about the money. I was trying to eat according to my plan that I had still with me, however to apply it to the new products and French way of eating was very difficult. I ate the lunch at the school canteen. Even if there was a large choice, there was often pork or beef or a chicken leg, sometimes quite greasy. In addition, I was not able to estimate proper portions and all the portions we got there seemed to me very big. I remember that I often left a half of the couscous or rice as I was thinking it is too much for me to eat and I may gain weight. Or, I ate only a chicken with some salad as I didn’t want to eat the pasta (too carbs for me I thought). I still didn’t have a correct and real estimation of “how much food” is enough and I still didn’t learned to orient myself according to my hunger. The simpliest thing to do, just to listen to my hunger!! And I was not able to apply this rule as I was too much oriented according to the modern imagery of dieting even if I needed to gain weight and to heal….The stereotypes society gives us are very powerful….There were still thoughts in my head like “this is too fatty” or “it is too much carbs for me”. I thought I could abandon a bit my plan and eat like I want as healthy people were doing, but it was too soon for me. First, I needed to attain a normal weight and understand that carbs and fats are not my enemy and it is completely natural and normal to eat them. It was a long journey I had ahead! What else do I remember from this first semester in Paris? I felt terribly tired and exhausted. I was able to fall asleep in the university library. I felt sad and lonely and I was terribly cold. I could not concentrate well to the book I was reading (Zorba the Greek). On the other hand, I was working very hard and seriously in the school, preparing myself for the bachelor’s thesis. I was walking a lot and riding a city bike. I was taking photos, going to the cinema. I found some friends also, and I have some nice memories to the moments spent with them. But I was damn badly lost when it came to my eating. This said, when I went home for Christmas, my family was terrified. Not only my parents, but also my grandmother, grandfather, everyone was telling me I am too skinny. And every time I didn’t want to eat something, they were asking me why. I felt very uncomfortable and obligated to prove them that I just don’t like it. I actually didn’t realize how much I lost during the first semester in Paris until this Christmas moment. During Christmas 2012, I had 47 kg, the lowest weight I ever had. My mother was quite straight with me as she was already very scared. She told me about a doctor specialized in Eating Disorders and asked me if I would come to at least one session he organizes. She gave me also a book he wrote and asked me to read it. I was very rejecting to all her suggestions as I didn’t perceive me as still ill.
Until now I remember the her tone of my mother, very very scared. Me, I categorically refused this reality. I thought I lost weight because of all those changes. When thinking about it now, those changes played certainly an important role in this “falling down again”, however it is undeniable that I was controlling what I am eating and restricting it in order not to gain weight. I didn’t remember much of what happened after. I think I promised my parents that I will gain weight. I went back to Paris. It was this period of an extreme cold (-10 degrees Celsius for several days). I felt terribly cold. I just don’t know how I survived it. I decided to buy a scale again to control my weight and to start to work on how I am eating. I went back to the calorie counting, this time to control if I am eating enough not to lose even more. I read a lot of articles about anorexia and nutritional income and tried to raise my intake according to the numbers. It did work slightly and slowly, but I think it was not enough. I think I was still controlling it too much and I just was not able to eat more than the numbers indicated. I was irrationally scared about this. I was bound to numbers as if it was something safe. I was scared of uncertainty and everything that I could not control. I also remember one very tough phone call with my mother. I think she asked me something about my weight, maybe if I gained and I remember my answer was very evasive. I don’t remember well where the truth was as I think I was following my established plan and was gaining, but very, very slowly. The sure thing is that I was not healthy. I remember she told me that we made a deal and was very severe at me. I was defending myself and was mad at her and then I think I just hang up the call. I was very sad, crying the evening and to prove to myself that I was on the way of recovery, I ate some raisin bun I bought. A silly small raisin bun..I remember I called one of my friends and spent some moments with him. The situation calmed down, but my future was uncertain…. Sometimes during the end of January/beginning of February, I went to the cinema to see an old movie called The River, shot by a French director called Jean Renoir. It was about three sisters living in India. The story was very contemplative and deep, but the most important thing is that there was a beautiful sequence of traditional Indian dance. I remember admiring the sequence a lot as it was connected with a context of calmness, peace and wisdom. As I was from my childhood very passionate for dancing (but never did it really) and during my high school years in Prague I was attracted to oriental culture, I somehow decided that I will try to find if there are classes of this dance in Paris. I did it also because I needed to find some extra-school activity. I just googled “traditional Indian dance course Paris” (as I didn’t know the name of the dance) and I found 3 schools offering the Indian dance called Bharatanatyam. I picked one that was situated in the district that I liked a lot, called le Marais, and I decided to go there and to try it. I remember coming there and meeting the teacher, a small Indian lady living in Paris. She asked me for how long I am here and I told her that until June. She repeated it with an amusement. I did understand why only later – actually that this kind of dance needs lots of time and years of practice, and it is not like a Zumba lesson when you come and leave how ever you want. In all the cases, I tried the first lesson and I was a bit surprised. There was no music, and the dance was based on taping the barefoot heels on the ground, making specific rhythms and following the counting of the teacher. It was very challenging for muscles (and especially for me as I didn’t have any), as we had to be in plie (knees bend, turn out position) all the class. But there was something special about it, I felt a philosophy behind it and it enchanted me. It was complex (lots of position of arms, lots of combinations). Also, the teacher seemed very wise and friendly and she invited me with other students to have glass after the class. I understood there was a consistent group of people and they seemed willing to include me in their circle. I also remember that it was sometimes during this first classes of Bharatanatyam that I had a quick thought in my head that “everything will be fine”, imagining myself the smell and the taste of a bowl of freshly cooked basmati rice. Weird thought, but for me, this image of me being friendly with the rice was important. However to make the image real was not so easy. I don’t remember well how exactly it continued. I know I felt in love with this beautiful, difficult dance. I wanted to come more and more often. In addition, others told me I should try with them also the Bollywood dance and I really wanted to do it. I know I was calling my parent to ask them if I can add to my Bharatanatyam also Bollywood. The reason I called them was mainly the financial question as the classes were expensive. I know they told me they were worried if I could handle it with such a low weight, but somehow I actually was. The underfed body and an distorted mind are able to do a lot….I also know that the teacher decided to organize a 3-weeks intensive workshop of Bharatanatyam in India and I really wanted to go there. Logically, my parents were worried. I don’t remember well the reaction of my mother, but I remember that my father told me, very quietly but seriously: “in India, it happens often that people may have diarrhea from the food, or other problems…And you have already a really low weight. I am worried about this…”. He didn’t tell anything else. Just one sentence, but it made me finally act. I wanted to go to India so strongly, that I decided that I will just find a way how to recover. In this period, I was reading some blogs written by the girls recovered from anorexia to help me with my fight, and I found there a piece of text written by an Czech doctor specialized in eating disorders (actually, the one my mother wanted me to go to), mentioning that to gain weight, you need to rise your nutritional income much more than you think. In particular, he was saying that to gain 0,5 kg per week, the girl should eat between 3000 – 4000 kcal a day (12600 – 16800 KJ). Surely, this amount was for me very scary. However, the wish to continue with dance and the idea of going to India with my new friends were this time stronger than my fear. I was able to create, with the help of my old counting-calorie site and some meal plan samples from the websites concerning eating disorder recovery help a diet plan touching the numbers mentionned by the doctor. It took me lots of energy and time. I realized, it was so much food that I could eat everything I could imagine and it won’t still be enough. However, I was consistent and each evening, I was creating a meal plan for the following days. I know that counting calories is not a good thing to do, but as I needed to feel I have everything under my control (not good either), to see the particular number and to have all the plan prepared beforehand helped me really to follow it very conscientiously and not to fall in the problems such as overeating and then vomiting. At this moment I really needed to have an order to follow as I was not yet able to use the simple common sense of “when you are hungry – eat until you fell fed up”. I had to see, how much I have to eat to fulfill my nutritional need. I know that I raised drastically the carbs income for all the 3 main meals (breakfast, lunch and dinner) and I also added two 250 ml drinks – usually one was some smoothie and the second was a flavored liquid whole fat yogurt. I ate also two rich snacks and a second dinner. I don’t know how, but I persisted. I know that the first week it was a bit like being in a fog and waiting when the way will show out. What would happen to me with such a sudden big amount of food? I was asking myself and was uncertain. But actually, I found that nothing dramatical happened. Yes, I did actually gained about 0,5 as I was supposed to, but my body seemed still the same. This finding made me understand that nothing bad will happen with me if I would be eating so much and at the same time, it encouraged me to continue. I wanted to heal very strongly and the vision of summer and India kept me going on. I found something to live for and anorexia ceased to be my friend and my main interest. I needed to get rid of it. I wanted to be with others, to go with them to the restaurants and not be afraid of eating, I wanted to laugh with them and not to think about the food. During the period from February to June, following my eating plan, I was able to gain something around 8 kilos. The number may sound terrifying, but actually the changings were so slow, that I didn’t even perceive it. On the other hand, I started to feel stronger, I was not so cold. I could finally feel calm and balanced and more self-aware. I was less depressed and stressed, I was able to calm down and even to enjoy a moment with a book, an evening with my friends or lying on a green grass in Parisian parks. I was able to enjoy taking a rest! My life was less oriented about food – yes, I had to follow a particular plan in order to gain weight, but I remember that I felt fine with it and I even enjoyed it. My issue was not that something is too much caloric but instead I was thinking about what energetic bar I should taste or what flavor of the whole milk yogurt I should buy. I understood that eating is safe and ceased being scared of it. I had new friends and I was looking forward to the summer. From a shaking skeleton I became more self-confident and even smiling student. The change was progressive and I don’t remember it well. I know that I felt happy that I was gaining weight as I really wanted to heal. I think that I felt that my life was getting back to my control and that I proved myself that I was strong enough to fight. This felling encouraged me to continue. I don’t know how my parents found that I was better, I think they went to visit me or so. But they were happy and approved my wish to go to India. Moreover, my mother also told me, after having consult it with her friend – my doctor, that I could try to discontinue the use of my antidepressants. I was very happy to hear it as I felt my mother started to trust in me. This stopping with meds had to be progressive, each week I should pick one day without the meds and progressively free all the week. I started with this procedure at the same time when my Erasmus program was ending and when we decided, with a few of my friends, to do a trip around the south of France and northern Spain. We were travelling by train and bus, from city to city and it was very tiring and intense. I had a very good time and was enjoying this journey a lot, even if sometimes, I felt a bit bad, like if I had low blood pressure or so – very probably because of this meds skipping. Sometimes I felt very week, there were moment of a light nausea or loss of appetite. Without my meds, I remember that I felt very free, liberated from some heavy bound. Like if I went back to myself after a very long journey. I think that during the holidays, I had about 56 kilos. Even if my weight ad well as my psychical state were far better, my mind was not completely healed yet. I was still very careful when it came to food. When I was in Paris or home in Prague, I was following my plan and I felt fine. However, I was still not able to leave it completely behind me and “just eat how I would like to”. I was thinking about the food too much. What is good and how much I should eat and also, if I eat enough or not. As I was still trying to follow my eating plan based on detailed income – outcome calorie intake, I was just not able to estimate how much I should eat without it. It was completely irrational, as I learned well by following this very very high-nutritionnal plan that I can eat everything I want and it still won’t be enough. Difficult to explain this fear, but I think it was my perfectionism that was controlling me. In all the cases, I never felt back to “not eating at all”. During the funny trip with my friends, I was still eating 5 or 6 meals a day and I didn’t allow me to skip any. Also, I was thoroughly not allowing myself to skip a side dish. Bread, Rice, I ate them with each feeding as I needed to. Also during the dance workshop in India, where I was finally allowed to go, I was trying to eat as I needed despite the fact that Indian eating habits are very different to what I got used to and what I was able to follow. I was a bit scared about their way of eating – to eat those Indian dishes consisting of large portions of rice, accompanied by various bread types whose amount I could not estimate, lots of heavy sauces (that I saw as too much fat) was for me very challenging. To accept to eat so much energetically-rich food in one portion and not to have a control about “how much rice or sauce I ate” was difficult. I think I rarely ended up the whole portion and I doubt that is was because I was full. Rather, it was because I had the impression that it is “too much” – the anorexia thoughts were still there. Paradoxically, at the same time as I was thinking in such a “dietic way”, I was worried that I will lose weight, as I was dancing a lot during the workshop. Also, my French mates ate very strangelyy for me. They didn’t snack (as French people do usually), sometimes they even didn’t eat dinner “because they were tired and were not hungry”. On the other hand, they ate a very big portions for lunch. Believe me, it is very difficult to persuade oneself that he can eat everything he would like to and as far as he is not stuffing himself each day with hamburgers and fries, it is completely fine. This need of a control and of restricting is even higher as large number of people that surround you are actually doing it this way. It was during this time of struggling with weight that I fully understood how the society is inserting in us a completely wrong body image and a very deviated idea of what is “healthy eating”, that is actually very close to severe diets. It was very common to me to hear people and friends around me saying “I don’t eat bread at all as I won’t gain weight”, or “I will eat only a salad for a lunch, I am watching my weight”. How one, that is actually struggling with anorexia, can learn or understand what does actually mean “healthy eating” and “eating enough” if a quite big part of the society and people around him does not do so? No wonder that my mind was so split and lost…I wanted to heal but I still wanted to control and I didn’t really have enough good models to follow in the broad day life. Only those helping pages and blogs about recovery could get me a bit of insight concerning the food as well as some samples. To win upon my mind in the diet-oriented society was really the most difficult part of the illness…. Well, this strange schizophrenic state of mind I was having persisted during the next years. Basically, each holidays, I lost weight because I was controlling my portions and food composition while travelling. I was then trying to re-gain my weight when I could follow my plans. During the unversity year, I was quite fine, I even cooked and baked a lot (healthy recipes, for sure!) and I enjoyed to eat what I did. However, each eating and daily life change was for me very stressful. Well, it is also true that my psychic was much stronger as I was able to overcome lots of difficult times without falling back to the depression. I overcame the Indian workshop during which the teacher turned out to be a very bad person yelling at us during classes. I overcame a half-year lasting insomnia that I had the following school year in Paris because of lots of stress from school. I was bravely fighting with French bureaucracy. And, I was strong enough to write and successfully defend my first master thesis in French. During the summer 2014, I was already very tired of the closed and unfriendly atmosphere of Paris and I decided to spend a month and a half in San Francisco. I went there to learn English as well as to visit and to experience the life in the US where I have never been before. I was walking there a lot. As I was missing my Indian dance, I found some kind of open dance classes in a small dance studio. I didn’t eat there enough to bear this physical challenge I created for myself. I still had in my head the wrong mind set when it came to food. Sure, I loved tasting everything there, tacos, banana breads, muffins,…But I was, still, very prudent and was eating like on a diet. When I came back, my mother told me that I really lost weight more than last holidays and I think she was worried again about my health. I told her that during difficult travels (I mean, when you are travelling and discovering and not only lying on the beach), lots of people lose weight and I ensured her that I would gain it back. I was circling again. The next year in Paris was very hard for me. I was very sad that I had to return to the grey and unfriendly city after such a nice experience in San Francisco. I was starting the last university year – 2nd year of Master – during which I had to write a long master thesis, far more longer than the first one. Also, as I was walking too much during summer (and not eating enough), so I got a tendinitis of the Achilles tendon. I remember that it first started to creak and then to hurt. I was worried a lot about this. And, on the top of that, I moved to the university residence. The initial idea behind this decision was very nice – I wanted to be more among people as I felt alone in my small studio. Actually, I had a friend that was living in this university residence and she persuaded me to move there as well. The idea was pretty nice, however, when I went there, I was shocked. I remember that I was very depressed by the place, as nothing worked there. The kitchen, showers and toilets were extremely messy, the electricity was falling down. And no one cared about anything. I remember that I was crying a lot the first months there. I was worried about “how I will cook” (as I needed to gain weight again), I was worried about the thesis and I felt terribly in the dusty room with wet walls. Paradoxically, it was during this year that I went out of the terrible anorectic circling. The reason why seems to be pretty poetic and again, it connects with dancing. While living in this terrible house and writing my thesis, I was still doing my Indian dancing. I did it with another teacher, as I left the evil one that made me very stressed and fearful in India. At the same time, I was doing Pilates in a small dance studio near the Bastille. Each time when I went there, I took a moment to watch the ongoing dance classes. I was very impressed by modern jazz dancers, moving so poetically and beautifully. So, once, I just decided to try one of those classes that amazed me so much. I took a long time to do so, as my ankle was still creaking and I was scared that I will make it even worst. However, my mom told me once (when I was talking to her and repeating her three hundred times that I am worried about my ankle): “Stop discuss it so much, you do lot of sport, it is normal that something hurts. It won’t pass so quickly…”. I took this sentence very seriously. I decided that I will try to pay to my problem less attention and I finally decided to give the modern/contemporary jazz dance a shot. I remember that I took the first class Friday evening, sometimes during the month of October and I didn’t like it so much. I was used to the physically challenging Bharatanatyam next to which the modern jazz seemed to me as a very mild and a bit slow exercise. So, I was not so motivated to come back. However, within some weeks, I reconsidered it. I felt that the modern dance is still attracting my attention and I started to think that maybe the basics are a bit slow but I should persist to gain access to this more interesting and passionate movements that I saw through the glass of the dance studio. Also, I thought that it would be beneficial to ease my pace and to learn to do something more relaxed. Those two decisions led me again to this small studio near the Bastille, to another beginner lesson of Modern Jazz with Julie Lopez. It was around the Halloween 2014, so end of October. And, something that I don’t really understand, happened. The choreography that the teacher taught us, on a very beautiful song of Joseph Salvat called Diamonds, had completely absorbed me. I remember the teacher told us some very sad story about soldiers trying to escape the bullets, I remember large, slow movements and the nostalgic melody. I felt like in a dream. I could just express so many feeling, without telling a simple world. I felt sad, nostalgic, and beautiful at the same time. And I felt in love with the Modern Jazz. I started to come more and more often and can’t really explain rationally why. I just felt the need to dance, to hear the music and have this freedom to express all the feelings that I was so often keeping in my interior as I didn’t like to talk so much. It was like a calling. It made me happy. It gave me strength to overcome all those problems with the house I was living in. Each time I was going home after the class, I was feeling generous and full of love to the world. It sounds very sentimental, but it was how I felt. Well…After, things have gone very quickly. I turned all my attention to dance. I could not imagine that I would have to stop or so. I wanted to learn the discipline better in order to understand it and to access deeper to the movements and gain more freedom of expression. I understood I need the ballet to do so. So, I dared, at my 24 years, to step into my first ballet class ever. I didn’t have ballet slippers, I didn’t know what ballet class looked like, but I just went there. I remember that I felt completely lost. I didn’t know what meant to straighten my legs, I didn’t know what meant to point my feet, I didn’t know the positions. The only thing I had from my Bharatanatyam was the plie position. I was completely lost, but I persisted. I found a very good and meticulous teacher and I progressively exchanged the big part of the Bharatanatyam lessons by modern jazz and ballet. Also, I started to take floor barre with my Pilates teacher to improve my positions. It started to occupy all my time and I started to looking for a way how I could learn more. I find an open program in New York, that was based on the principle “you pay – we teach you dance”. It basically meant that they didn’t care about the level and were accepting even beginners – so, good for me. I started to consider this option and I was looking for a way how to talk about it with my parents, as this program was extremely expensive. At the same time, I found out that the studio where I was dancing has also a professional dancing school. I thought that I am too old to do this, and in addition I don’t have any experience, but I found on their pages that they are accepting “students from 16 to 35 years”. I remember I told myself that I have 10 years to learn to dance and to enter the school. I also find there an interesting program called “young dancer” that was described as a program for the dancers that would like to train professionally but don’t have the appropriate level yet. I knew that there were a few girls doing this preparatory program that were taking the same classes as me, so I just decided to write to the school an e-mail. I remember that after I send it, I hoped that they won’t finally read it. “How foolish you are, Jana…” I was telling myself and keep continuing to take classes. All this happened during first week of January and it took quite a long time that I learned that the school red my message. It was my teacher that told me, when we were doing the choreography, to join her group of the “preparatory students”, mentioning that “we had a small message and we keep talking about it”. Well, no wonder that I started to be stressed and I started to ask myself lots of questions and imagining what could happen. I was concerned that the teacher was comparing me with others and that I was not good enough to train in dance (well no wonder, I was a complete beginner). I was worried she would tell me I did’t have any talent and I just had chosen the wrong way. I was worried to learn that maybe I should not dance….and…I just could not imagine such an answer as I needed to dance and could not imagine to quit. I was very fatalistic at the time. Given that I lived in a terrible place, I felt bad in Paris, I had still issues with my mental health and I was writing the thesis, no wonder that I keened on the dance so much. It was my moment when I could be myself, the moment I could breathe and feel, to express and not to worry…. It was for me (and still is) something I needed very deeply for my life. Well, after two weeks that I was extremely stressed, I just dared to come to the teacher after class and asked her, what was happening. She told me she just took a bit of time, but that it could be a good idea to talk about it. She told me, that the professional school is for people that would like to become professional dancers and asked me, what I want from it. I remember I told her that I just don’t know, that I just need to find a way how to include dance into my life and that this need is irrational. After this, she told me: “There is something nice that could develop. You’re working hard, I know this, but I am worried because the others are already in advance. You have to work twice they do…”. After she mentioned that if my interest in dancing is irrational and I feel the way i told her, she will approve my acceptance. She told me that dance is irrational and she will let me try it. She also told me that no one can know, if I could be dancer or no. It is the time that will show…. For example, she’s been told that she would never be a dancer…And I did not stop her to do what she loves!! And she was a very beautiful dancer!!! So, basically, she opened me the door even if she knew I don’t know anything and I am an absolute beginner. And, by this approval, she basically offered me the way out of my vicious cycle. Well, after this foolish act, I had to call my parents what happened, as I didn’t want to tell them before in the case nothing special happen. My mother told me she would support me and promised me to talk a bit with my father first, as my father hates dance and we knew that it would be for him very difficult to accept the idea that his daughter, that is finishing a University degree, would like to dance. Well, finally, as far as I was writing the thesis and studying well, he told me he was ok with it. He told me also, a bit like when I wanted to go to India : “Ok, but mainly eat enough!” – the eating disorder issue, hidden unerneath my new dancing passion, came out again. And again, as in the case of this strong will to go to India, I wanted to do everything I could to get over the anorexia once forever. My live ceased to turn around food and started to turn around dance. Even if it was very stressful half year full of uncertainties, it was the moment that really healed me. I progressively attained my initial, normal weight (that was around 62 kg) and I ceased to control the food so much as knew I must eat enough to be able to commit at about 7 or 8 classes of dance per week. Now the issue was to have enough energy to work well and not to look after my weight. The need to feel healthy and happy drown out the socially distorted mind oriented to the weight gain. This modern dance, and this beautiful teacher, basically saved my health and maybe even my life. The dance taught me to enjoy life and to listen to my body. To take a rest when the body needs it, to eat when it is hungry. And also, it helped me to feel happy again, strong again, it allowed me to express my feelings that I was hiding so long. At the end of this year, I successfully defended my final master thesis and, I was accepted to the 1st year of the professional school. I have to mention that I really didn’t have the level I needed and I think it was just the good will of the teacher that decided to give me a chance. I am very grateful to her. The following year in this dance school was for me very tough and I felt very bad, stressed and ponderous. In addition, at the end of this first year I was told that my bases are fragile and I have problems with coordination (well I never dance before so I should not be surprised). I heard lots of critique and felt that I failed. Again, it was this teacher of mine that helped me and encouraged me to continue. She encouraged me and here I am, now, in New York, dancing again and trying to improve. Without stress and with lots of motivation and love. It is truly the dance, its deep magic and power that showed me the way out of the vicious circle. And here I am, now, in New York, keeping doing and trying to improve in the discipline that healed me…I don’t know what future is waiting for me, but I am trying not to worry about it and benefit from my stay as much as I can. I would love to gain the ability to express all I lived through movement one day…It would surely be a complicated piece, sometimes sad and depressive, but with a poetic happy end :). As Martha Graham says, ” dance is the hidden language of the soul of the body”. I am no longer counting calories and I even don’t have a scale. I am eating regularly, breakfast, snack, lunch, snack, dinner and even the second dinner, according to my appetite and need. I love bread and chocolate. I still eat heathy but I am not restricting anything. I am not scared of salty pretzels consumed during a nice evening with my friend. I love chocolate cakes and French pastry. I enjoy the food a lot and I am happy of it, as well as I am happy of the life. I am glad to everything I have. For sure, I have bad days and I still fight my perfectionism, as well as I feel sometimes sad, nostalgic or stressed, but it is just a part of a normal human life. On the other hand, I learned how our life is precious as well as I understood to what point we are wasting it by stress. It is so easy to look for problems, but much more difficult to find small pleasures and be happy of them….As far as we are heathy and we have our closest ones that love us, we have a beautiful life. I wish you all to find a way from all your problems. There is always a way out of them.